Some of Johnny Cash's best-known works are his live albums, in particular the late-'60s releases At Folsom Prison and At San Quentin. Now, a couple of his archival concert recordings are getting reissued through Columbia Records/Legacy Recordings. 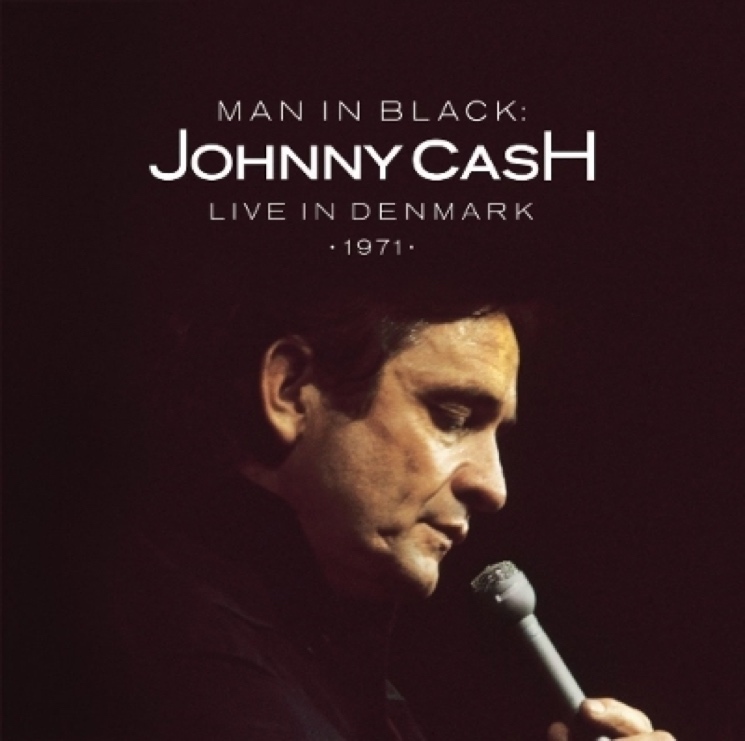 First up is Man in Black: Live in Denmark 1971, which was originally recorded for a Danish TV special and was previously only commercially available as a DVD (released in 2006). The audio is now being made available: the CD and digital versions will be out on December 4, while the red and white double vinyl (to match the Danish flag) will be out on Record Store Day's Black Friday event on November 27. According to a press release, the show "captures the essence of a Johnny Cash show of the era, showcasing performances with his touring companions — the Tennessee Three (his backup band) June Carter Cash, the Carter Family, Carl Perkins, and the Statler Brothers — on a setlist of hits, classics and songs-of-the-day." In 2016, Koncert v Praze (In Prague-Live) will then be released on CD on February 5. Recorded in 1978 in Czechoslovakia, this was apparently the first time a popular American artist had performed behind the Iron Curtain. It previously got a Czech vinyl pressing back in 1983, and it was reissued on red translucent wax for Record Store Day 2015. This is the first CD pressing. The concert features backing from the Tennessee Three and singing from the Carter Family. Check out the tracklists below. The sets include celebrated tunes like "I Walk the Line," "Folsom Prison Blues," "A Boy Named Sue" and "Ring of Fire." 1. Johnny Cash - "A Boy Named Sue"
2. Johnny Cash - "Sunday Morning Coming Down"
3. Johnny Cash - "I Walk the Line"
4. Carl Perkins - "Blue Suede Shoes"
5. Carl Perkins - "Matchbox"
6. Johnny Cash - "Me and Bobby McGee"
7. Johnny Cash - "Guess Things Happen That Way"
8. The Statler Brothers - "Bed of Roses"
9. The Statler Brothers - "Flowers on the Wall"
10. Johnny Cash - "Folsom Prison Blues"
11. Johnny Cash & June Carter Cash - "Darlin' Companion"
12. Johnny Cash & June Carter Cash - "If I Were a Carpenter"
13. Johnny Cash & June Carter Cash - "Help Me Make It Through the Night"
14. Johnny Cash - "Man in Black"
15. The Carter Family - "Introduction to The Carter Family"
16. The Carter Family - "A Song to Mama"
17. Johnny Cash, The Carter Family & The Statler Brothers - "No Need to Worry"
18. Johnny Cash, The Carter Family & The Statler Brothers - "Rock of Ages"
19. Johnny Cash, Carl Perkins, The Carter Family & The Statler Brothers - "Children, Go Where I Send Thee"